Vancouver is the largest city in British Columbia and the third largest city in Canada. Its beautiful setting and moderate climate makes it an attraction for increasing numbers of residents and tourists. Downtown Vancouver with its magnificent Stanley Park is both a destination and a stop-off point for dozens of cruise ships. The view which these travellers get from Vancouver Harbour is unequalled anywhere. The Fraser Valley to the east of Vancouver is home to a number of burgeoning cities: Surrey, Langley, Abbotsford, Chilliwack, and numerous smaller communities. Built on the fertile Fraser River delta, these communities have retained their agrarian roots while at the same time building a more diversified economic base. 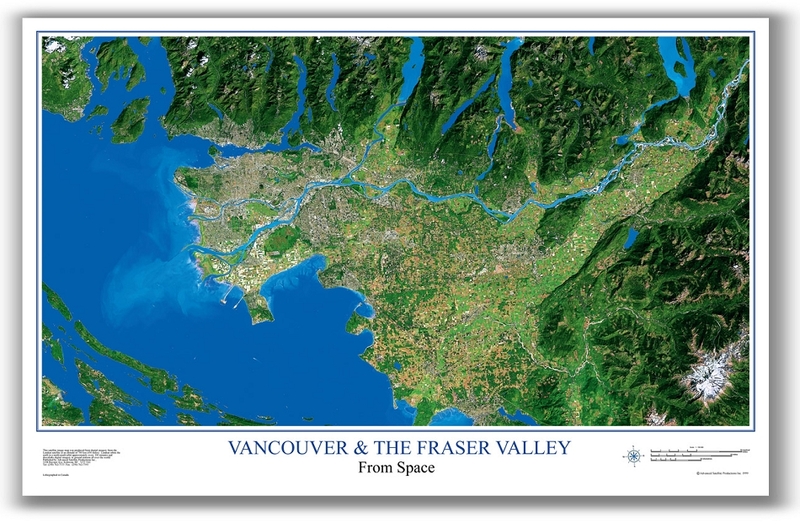 Our Vancouver & The Fraser Valley poster shows the beauty of the area even from space. Feature: 39 in. by 25.5 in. Feature: Scale: 1:180 000 Approx.